Fans and heat sinks have been the cause of much discussion for years. 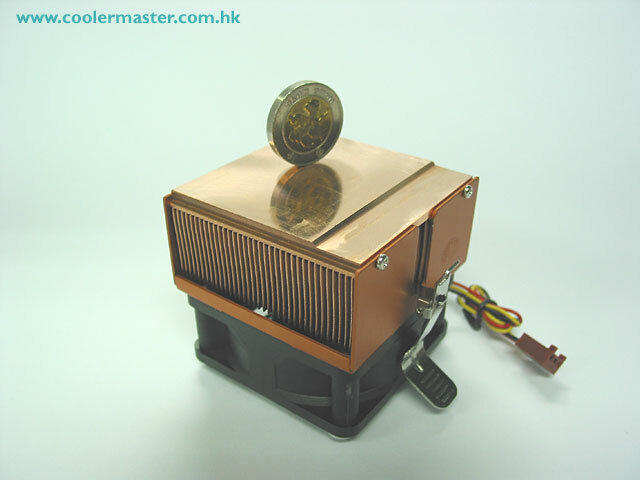 Heatsink fan combinations have been inspected for all aspects of heat dissipation, mostly to come up with 2-5 degrees of difference. Throw in fan RPM, and 60 decibels for sixty millimeter fan and 49 decibels for an eighty millimeter fan and the price of rice in china along with the speed of an Indy car at operating temperature, before you know it, you'll be hitting the redline for data overflow. 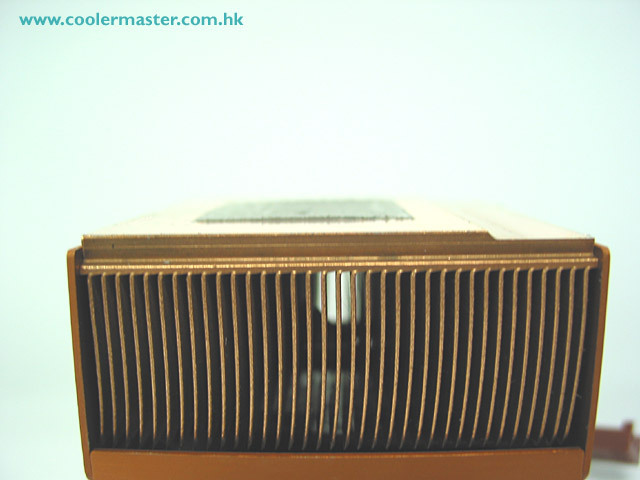 Marketing techniques can have many different disguises, Cooler Master has cracked the marketing ploys and produced a true quality product in the HSC-V62 heat sink and fan unit. 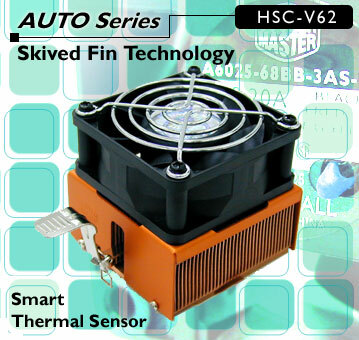 Skived fin technology and smart thermal sensor placement have been combined to produce a more intelligent determination of the actual processor heat in relation to the heatsink and skived one piece fins/base to assist in the removal of heat. The real thing to keep in mind is this, a processor with be burn up at 65˚C/149 ˚F (Intel) and 90˚C/194˚F (AMD). Stay under that range under heavy usage conditions, and you have picked the right fan. Stay well under that and you could possibly do some over clocking, but that's another article. The Cooler Master HSC-V62 was well under that number coming in at 48˚C under heavy usage conditions. That's 119˚ Fahrenheit, only 20˚ above body temperature if you look at it like that. In a home that is kept at 76˚, that is a 43˚ difference. The testing platform is an AMD XP2000, on a Soyo DRAGON Ultra, with 512 Mb of DDR PC2700 (333 Mhz). Please note that the case this is mounted in a Kingwin KT-436 case View it here!. This case has six fans to increase airflow through the case. In addition, custom folded cabling has been utilized to prevent airflow blockages. This is to say that performance could differ from application to application. Skiving - "Skiving" is the process or running a blade across a copper block and shaving a slice of the copper that curls upward to form a single fin. Using sharp carbide cutters, skiving quickly shaves off to specified thickness', and is superior to milling in key ways: surface finish, uniform metal stress and cost. . This is repeated until the designated amount of fins are "skived"
"Skiving is used successfully for parts requiring close diameter tolerances or finishes". This means a part can be produced that requires little of no finishing. The surfaces are polished by the tight tolerances during the process. This technique is used commonly on Copper Alloys, Brass Alloys, Phosphor Bronze, Beryllium Copper, Nickel Silver. In case you did not notice, mostly soft metals. This process is also very inexpensive. Many producers hire out to third parties produce parts, so companies desiring a skived product do not have to buy a skiving tool or need extensive production knowledge to build a product. The thermal sensor on this heat sink is on the inside of the unit against on of the fins. "The thermal sensor actually protrudes from below the fan motor so it is in the region which isn't directly cooled by the fans intake air; this way, the thermal sensor can detect the temperature of the top of the heat sink precisely." This helps to get a more accurate temperature or the heat being generated by the processor and not heat being generated inside the case or the cool airflow being supplied being a external fan to aid in cooling the processor. Recently, a co-worker ordered a Volcano HSF for his machine.. I had the ability to inspect the Volcano and the sensor was mounted outside the heatsink and physically touching it, we could hear quite clearly a big increase in fan speed. It is my expectation that case heat or additional case fans will have a negative effect on CPU cooling fan speed. 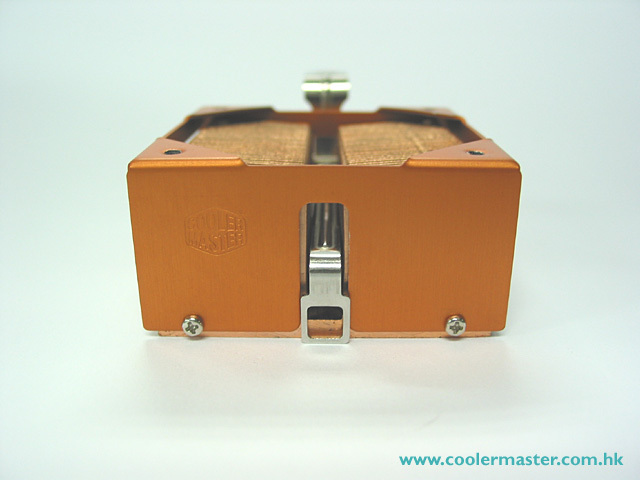 "Some coolers have their thermal sensor placed at the edge of the fan. What they are measuring is the ambient temperature inside the case rather than the CPU's temperature. 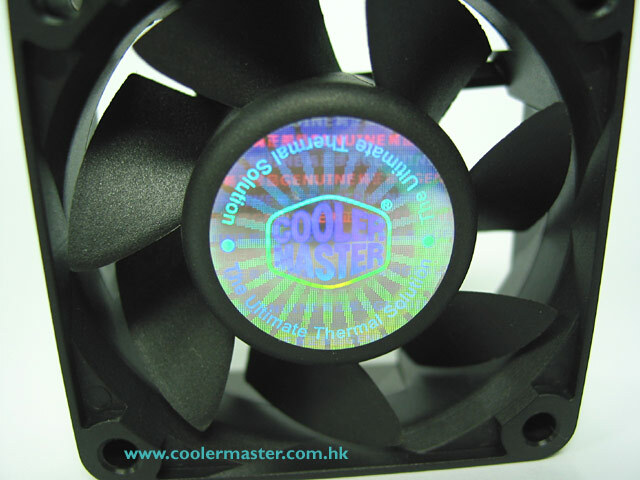 However, if the temperature inside the case is hot (especially in summer), the fan's speed may always be at a higher speed than necessary. There are others that place the sensor underneath the fan's "leaf". As the sensor is making direct contact with the airflow, the temperature cannot be measured precisely." The result of this has been directly measured by this "Speed vs. Temp" chart that is placed on the rear of the box. 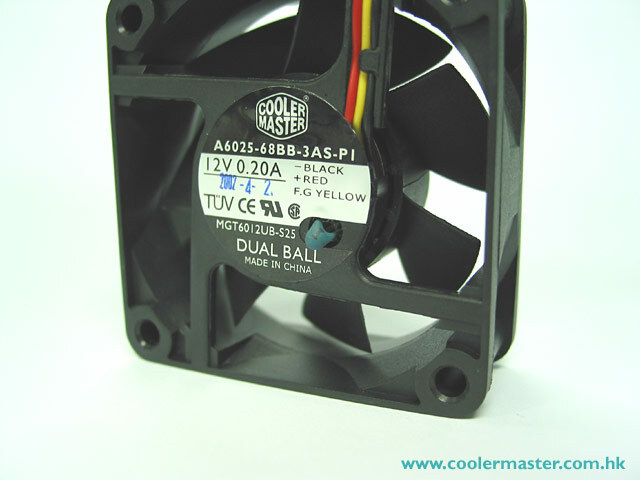 The fan in this unit is a quiet 60 mm dual ball bearing fan. Rated Speed 3000 ~ 6800 RPM, Air Flow 16.13 ~ 36.11 Cubic Feet/Minute, Rated Voltage 12 Volts DC. Good quality fan, not sure who it's made by. The fan is further ducted using a shroud to get the airflow to reach the base before airflow dissipates. This is a big help when talking about fan performance and can turn a run of the mill fan into a heavy hitter or heavy cooler as it may be. Not much to report here.. the maximum temp that could be achieved using this test configuration is 119˚F and idle temp of 115˚F (at a fan speed of 4688). Several series of benchmarks were run and the processor just could not get hot with this HSF unit. There is a bit of a discrepancy in these readings though according to the chart. According to the chart, with a fan speed of 4600 RPM my processor should be at ~42˚C/107˚F. The flipside of that is if my processor is at 48˚C/119˚F then my fans speed should be about ~6500 RPM. From what I can figure, the graph readings apply to the thermal sensor temp for the heat sink, NOT the sensor under the processor which . At any rate, the performance of this unit is highly acceptable, and given the upper limits of CPU temperatures, would recommend this heat sink and fan unit to other users without hesitation.